Do I Need a Copyright Symbol? The copyright symbol has a long and interesting history. The copyright symbol, first introduced in 1909, has a long and interesting history—and because of this, it’s sometimes difficult to determine if you need a copyright symbol or notice on your work, or if that symbol is optional. Let’s take a look at some of the iterations of copyright law, how it relates to the copyright notice, and how this affects your work. Entered according to act of Congress, in the year [year], by [copyright owner’s name], in the office of the Librarian of Congress, at Washington. The copyright symbol, (c) or ©, did not exist at this time; rather, this entire notice was required on the work itself (or, in the case of artwork that would be ruined by such a sentence, on a plaque or mount for the artwork). Copyright, [year], by [copyright owner’s name]. This made things much simpler for visual artists, though the notice still had to be directly inscribed on the work whenever possible. During the first decade of the 1900s, it was proposed that even works of art, such as paintings or photographs, should be required to display the new shortened notice directly on the face of the art. This decision was, understandably, met with resistance from the artistic community, who felt that such a requirement would be intrusive and cheapen the artistic integrity of the work. It was then that the copyright symbol—(c) or ©—came into being. 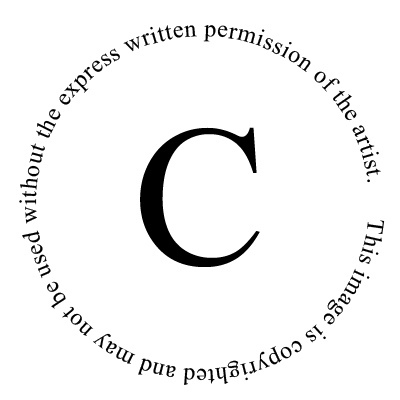 It was felt, among some circles, that an encircled capital C, (c) or ©, would be much less awkward to be placed on the face of a work of art while still providing the required notice of copyright. However, the law that eventually passed did not take into consideration that owners of copyrights for works other than visual arts might also wish to limit the wording of the required notice—in 1909, the copyright symbol was an option for only certain works, like paintings and photographs. Other works were required to display the full notice. This notice requirement was incorporated into title 17 of the US Code in 1946. In 1954, the 1946 law was amended to remove the full copyright notice requirement, allowing (c) or © as an option for all works, visual or otherwise. After the US Copyright Act of 1976, which was later amended when the United States enacted the Berne Convention (a type of international copyright agreement) in 1989, everything changed. The Berne Convention provided copyright protection for copyrightable works regardless of whether a copyright notice appeared on that work or not. The copyright notice suddenly became optional. Of course, this led to not a small amount of misunderstandings about the status of any given work. It used to be, if there wasn’t a copyright notice, the copyright was not claimed by the author. However, the 1989 implementation of the Berne Convention placed the responsibility to respect copyrights firmly in the public’s hands. Now, whether a photograph, story, or painting bears the copyright symbol or notice or not, the public must assume that it is still copyrighted, or they may risk being responsible for copyright infringement. There is no legal defense for ignorance of this law. Click&Copyright can help you register your copyright today!